The following terms and conditions do not affect your statutory rights as a consumer. All prices quoted are inclusive of VAT @ 20% Click4 Limited makes every effort to ensure that prices displayed are correct and current. Should pricing prove incorrect, prior to order processing, Click4 Limited will contact the customer to make them aware of the price difference. Orders placed online do not constitute a confirmed order until Click4 has checked stock availability and processed full payment. Never allow yourself or anyone to inhale helium gas either from balloons or directly from a pressurised cylinder. Use helium cylinders in a ventilated area. Inhaling helium reduces and can eliminate oxygen available for breathing. Inhaling helium can result in serious personal injury or death. By ordering helium gas cylinders you are agreeing to use the product responsibly and indicating your understanding of this safety warning. 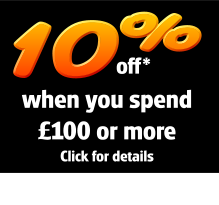 Customers can place orders and specify during Checkout a future delivery date up to 12 months in advance. Our despatch system will automatically schedule your desired delivery. Orders must be placed online with the correct delivery rate paid or specified. Delivery Rates and Expected delivery dates are displayed online and through Checkout. Payment is processed securely online in real-time during Checkout by SAGEPAY or PayPal. Orders paid with SAGEPAY can deliver to any address provided 3D Secure Authentication is processed correctly. Statements will show a debit by Click4 Limited. PayPal Orders will only be delivered to the address linked to the PayPal account. Change this with Paypal prior to ordering as required. Orders cancelled prior to despatch from Click4 will be refunded in full if notice is given in writing, on the day the order was placed. If notice is given after the order date, then the refund will be less 3% covering financial costs incurred by Click4. If you wish to cancel your order after goods have been despatched (collected by the courier or passed into the Royal Mail Network) or delivered then customers must return the goods undamaged, unopened and un-used to Click4 within 7 days of delivery. Customers return goods at their own expense and are liable for losses or damages in transit until the goods are signed for by Click4 Returns. Click4 will then process the customer’s return if the goods are unopened, undamaged and un-used within 7 days of receipt. Subsequent refunds will be processed within 30days. Any outbound delivery charge paid by the customer to receive their goods cannot be refunded. Goods returning to Click4 by Couriers, after failed delivery attempts, refused deliveries or cancelled consignments after despatch had occurred will incur the standard £12.95 return fee levied by the courier which will be automatically deducted from any refund due. Refunds for returns will also be less 3% to cover financial costs incurred by Click4. Goods returning via Royal Mail will not incur this return fee, however, if they were despatched on a 'Free Delivery Offer', then £3.95 will be charged retrospectively to cover the outbound delivery costs paid on the customers behalf by Click4. Special Order items cannot be cancelled and items qualifying for Bulk Prices cannot be cancelled as we do not operate a 'sale or return' policy. This also applies to Business Customers who fall outside Consumer Contracts (formerly Distance Selling Regulations) and so have no cancellation rights once an order is despatched. Business Customers can cancel an order prior to despatch, unless goods have been ordered-in especially for their order. Cancellation prior to despatch for B2B will also incur 3% cancellation charge to cover Bank Charges as outlined above. Custom Printed Balloon Orders have no cancellation rights once the Product is printed. All cylinders are checked prior to despatch to ensure that the cylinder is full of helium gas, working correctly and fit for purpose. This ensures that Click4 does not send out to customers, empty, damaged or faulty cylinders. Please read the operating instructions supplied with your cylinder carefully. If you require assistance please call 01494 723041 immediately. Use disposable helium cylinders at room temperature. During continuous use, the cylinder may become cold at the bottom. This is a safe reaction. Allow the cylinder to return to room temperature to continue using. The green cylinder valve on top of each cylinder opens anti-clockwise and closes clockwise. CYLINDERS ARE LIGHTWEIGHT AND NO LIQUID CAN BE HEARD INSIDE. CYLINDERS DO NOT DISPENSE AUTOMATICALLY ONCE THE GREEN VALVE IS OPENED. The black nozzle attached must be depressed to dispense the helium gas. The black nozzle should be pushed downwards, or if this does not work, pushed to the left or right to dispense the gas (one direction will give the best pressure flow). Green cylinder valves after use should be closed by turning clockwise. NEVER FORCE YOUR CYLINDER VALVE IN EITHER DIRECTION. Ensure the cylinder valve is fully open anti-clockwise to maintain full gas-flow. If you suspect your cylinder is empty or faulty, you must call 01494 723041 within 24 hrs of delivery. The cylinder in question can be returned to Click4 by the customer at their expense. Click4 will not collect cylinders and does not cover the return cost. The cylinder will be sent to the manufacturer for testing. In the unlikely event that the cylinder proves to be defective, Click4 will refund the cost of the cylinder and the return postage paid by the customer limited to £8.00 if a postage receipt is provided. Claims that cylinders are empty or faulty made later than 24hrs after delivery, or instances where customers have failed to follow operating instructions or inflation advice from Click4, resulting in a subsequent refund request, will be refused by Click4. Click4 reserves the right to make substitutions of comparable products should your first choice be out of stock. In this instance, Click4 will attempt to contact the customer to discuss available substitutions by email. If we have been unable to contact the customer prior to 4pm and the goods must be despatched in order to meet a ‘Delivery’ or ‘Use By’ deadline, then we will include the best substitute or refund the out of stock items onto the payment card used to place the order. If substitutions are not required, then customers can return unused and unopened items to Click4 for a refund. Click4 does not cover the return cost. Goods offered with manufacturer warranties are clearly marked. Click4 is unable to donate goods and services free of charge. Goods are despatched using a variety of options selected in the shopping cart. 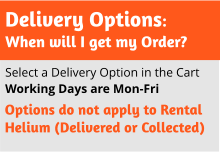 Guaranteed options are clearly marked which our couriers guarantees to deliver before 5.30pm as standard on weekdays and between 7am and 1pm on Saturdays. Residential addresses may run slightly later than this. Rental Helium Cylinders are delivered by a third party network of agents covering the UK (These deliveries are only available Mon-Fri and time-slots are not offered). Orders may also be despatched on Royal Mail but you will be advised how your order is being delivered by email, once the order is despatched. Disposable Helium Cylinders and Balloon Kits cannot be delivered to Ireland, Northern Ireland, Scottish Isles, Isle of White, Isle of Man or any Non-Mainland address. Online orders for disposable helium cylinders or Balloon Kits, placed for non-mainland addresses may incur serious financial penalties from the Civil Aviation Authority from £350 upwards if Click4 is unable to halt the automated systems. Pressurised containers cannot be transported by air. Rental Helium Cylinders are available in some areas such as IOW, Northern Ireland - please call 01494 723041 for availability. Some couriers now offer 1-Hour ETA Time-Slots which can be obtained by tracking your consignment directly with them online. Time-slots are not offered by third party delivery agents for Helium Rental Cylinders and so Click4 is only able to offer limited tracking assistance. We can pass-on requests but cannot be held to these arrangements as we have no direct control over drivers routes etc. Please ensure someone is available at the delivery point to sign for the goods on the day of requested delivery. Goods can be left unsigned, if during ordering, customers specify a ‘Leave Safe’ instruction which tells the delivery agent where to leave goods securely if no one is available to sign for receipt. This is expressly done at the customers own risk and Click4 accepts no liability for lost or stolen goods. Customers are asked to specify an ideal delivery date for each order placed. Click4 Limited endeavours to meet all specified delivery dates subject to stock availability. In the event that a signature is unavailable at your specified delivery address, the courier will attempt to leave a card indicating that the delivery has been attempted. The card will also give details of the automated telephone line provided for customers to rearrange their delivery for another occasion. The courier will redeliver once more free of charge. If they are asked to redeliver a third time the customer will be charged an additional £4.99 by Click4 for each subsequent attempt. Customers can arrange with the courier to collect their consignment from the nearest depot. When collecting goods, the person who ordered the goods must take some suitable ID with them to their local depot. If goods are not collected with 4 days or goods return after being refused at the delivery address, they will be returned to Click4. 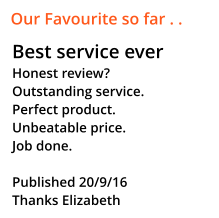 In this instance the customer will automatically be charged an additional £12.95 return-fee. If the customer would then like Click4 to re-despatch the goods, the customer must pay the return charge plus the prevailing delivery rate. Please do not leave goods with courier for longer than 4 days as this creates unnecessary charges to the customer, which Click4 incurs and must pass on. Once an order is despatched, we cannot change a delivery address for security reasons. Please note that the Guaranteed Timed services provided by the courier are guaranteed by themselves, and not Click4. Should they not meet a deadline, Click4 will liase with the delivery company and endeavour to obtain compensation for the customer. Click4 however, cannot be held responsible for a Third Party guarantee as it is beyond our control. If goods arrive too late for an event, the best course of action is to sign for the delivery, to prevent the Return Fee and then return goods by 2nd Class Royal Mail or Royal Mail Standard Parcel service to Click4 for a refund. If Click4 or the delivery agent was at fault for the late delivery, then the Goods will be refunded (if unused) plus the outbound delivery charge paid. Click4 will attempt to compensate your return postage limited to £3.00 if a full receipt is provided. These cylinders remain the property of Air Products Ltd at all times and can only be hired for a maximum of three months. Unused helium gas at the time of collection cannot be refunded as cylinders are emptied before being refilled to ensure that no contamination occurs for the next customer. CLICK4 does not ask for a financial deposit against the safe return of the cylinder. Instead we will send you a CYLINDER AUTHORITY FORM by email which outlines the Booking details and Replacement charges. This form must be signed and returned to us in order to complete your Booking. CLICK4 is unable to deliver any helium gas to you without a completed CYLINDER AUTHORITY FORM. By placing your order you agree to the Replacement Charges outlined below. In the event of a lost/damaged cylinder or inflator, or additional delivery/collection visits, your credit card will be automatically billed. Lost, Damaged or unreturnable cylinders are charged at: PT10 £295.00 each N10 £349.00 each N20 £349.00 each and N30 £425.00 each | Lost or damaged inflators £29.38 | Additional Delivery or Collection visits / change of Address £42 per occurrence. | Amendments to order £10.00 administration fee | Additional Rental: £18.00 per month/part month per cylinder applicable after the initial 90 day hire period. Only one month extension so maximum hire of any cylinder is 4 months from collection or delivery. Additional Charges outlined above will be charged to your credit/debit card automatically which you authorise Click4 to do by placing your order.